Sinterklaas, the celebration of the feast day of St. Nicholas is the biggest children’s holiday in the Netherlands. While the holiday itself is celebrated on December 5, throughout the Sinterklaas season actors playing St. Nicholas and his Black Petes visit towns and cities around the country. Over the last few years a fierce debate has emerged in the Netherlands about the controversial character. Traditionalists say Black Pete is just part of an innocent children’s holiday which also includes singing songs, exchanging poems, gifts and spending time with family. Some even say he only appears Black because he was covered in soot when he came down the chimney bearing gifts. For them, it is in no way associated with slavery or racism. However, those against the tradition quickly point out that the character comes from the 19th century children’s book “Saint Nicholas and His Servant,” in which the servant, Black Pete is described as a Black Moor from Spain. 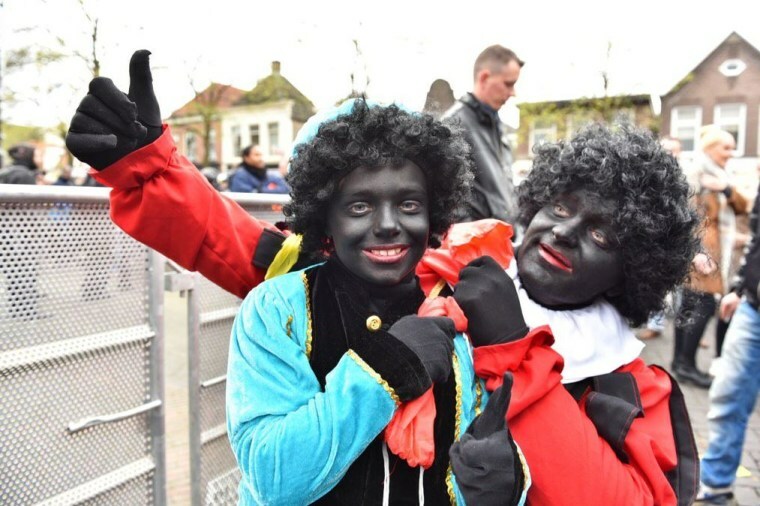 While Black Pete may be part of Dutch folklore,his portrayal is part of historically negative stereotypes of Black people dating back to colonialism. “For white people it’s great, but for Black people it’s one of the worst times to be in Holland because everywhere you go you are faced with this offensive Blackface, offensive caricatures reminding a lot of people of slavery,” said Mitchell Esajas, co-founder of Stop Blackface which is part of the Kick Out Zwarte Piet (KOZP) coalition in the Netherlands. KOZP’s peaceful protests against Black Pete have received many messages of hate and threats of violence. Following the first protest this year at the national Sinterklaas arrival parade in the city of Meppel, Esajas says a selfie he posted on Facebook of some KOZP members received 10,000 threatening and racist reactions. Among them were threats of bodily harm and even death for, as one commenter put it, “trying to f**k up a children’s party” in a country where Black people are only “guests”. Esajas says it’s comments like these that show just how little many Dutch actually know about the country’s history of widespread colonization and its major role in the transatlantic slave trade. “We are Dutch and there are thousands of people who feel this tradition is hurting them. They are also Dutch. They grew up here. They were born here.” said Jerry Afriyie, an activist and artist whose violent 2011 arrest for protesting Black Pete along with fellow artist Quinsy Gario helped bring the issue to the mainstream. “The Dutch people, they believe about themselves that they are tolerant, but then when you point this out you get this aggressive reaction and it shows there is this conflict within. It shows that there is something wrong...It shows that there is racism,” Esajas added. “When you talk about these things people will say, ‘ah there is no racism here. Racism is something of America’, said Afriyie. These Dutch activists say the stereotypical representations of Black people are not limited to Black Pete in the Netherlands, but are just one example of the discrimination that Black people face regularly in countries across Europe. They see their fight against this tradition as well as other forms of racial inequality is part of a global struggle against racism. In 2014 the UN General Assembly proclaimed 2015-2024 as the International Decade for People of African Descent(IDPAD), citing a need to strengthen international cooperation as it relates to the economic, social, cultural, civil and political rights by people of African descent. It has called on its member nations to design major anti-racism legislation and to ensure that citizens of African descent worldwide are included in national policies. There are specific recommendations the UN outlined for member nations worldwide to implement, but according to Jallow Momodou, Vice Chair of the European Network Against Racism (ENAR), after an estimated 134 meetings this year with European policymakers he has yet to be told of any concrete plans. “I asked them, ‘What are you going to do, is it conferences, policy changes, programs, what?’ And most of them don’t have an idea what they are going to do or if they are going to do something,” he said. According to the European Network Against Racism (ENAR), people of African descent and Black Europeans are one of the largest minorities in Europe and are particularly vulnerable to racism across the European Union (EU). For example, Black people in the United Kingdom are on average six times more likely to be stopped and searched by the police than other groups. In Sweden, a 2014 report on racial discrimination revealed that Afro-Swedes are the minority group most exposed to hate crimes. Police brutality is also reported to be a major issue in countries across Europe. There have been calls for police reforms in response to numerous deaths of Black people following police encounters. At Berlin’s May Day parade this year, activists with Berlin’s “Ferguson Is Everywhere” campaign demanded justice for Christy Schwundeck and Dominique Kouamadio, both of whom died in encounters with German police, and Oury Jalloh, who burned to death while handcuffed to a bed in a police cell in 2005. It’s what Momodou says are just a few examples of Afrophobia, a relatively new term used to define specific forms of racism and structural discrimination directed towards Black people. Momodou said the term Afrophobia is deliberate: it should not be confused with any other form of racism experienced by other groups, particularly when translated between languages. “There is a Ferguson in every European city and we need to acknowledge that is a reality that Black people face no matter where they find themselves,” he added. The numerous parallels of Afrophobia between Europe and the U.S. is one reason Black Lives Matter Co-Founder, Opal Tometi believes forming partnerships is imperative. “It’s extremely important to work in solidarity, no issue is only local. Neoliberalism and globalism exploits all our communities in the same ways. Our lives are intertwined – communities of the Global South, communities of color and low-income communities in the United States,” she said via email. Tometi traveled to Europe earlier this year to connect with activists in Germany and the Netherlands as part of an effort to build stronger transatlantic alliances and work toward meaningful solutions. During a December 8 “Roundtable on Combatting Afrophobia” in Brussels at the European Parliament, members were urged to implement concrete plans for national strategies to address the continuing racism and racial discrimination faced by Black people in recognition of the UN’s International Decade for People of African Descent. In response, Prime Minister Mark Rutte said that it was not the government's job to shape folklore, but up to society to decide how the tradition evolves. However, Dutch Deputy Prime Minister Lodewijk Asscher, said the country must eventually reinvent the character in a way that respects both those offended by the figure and those who want to preserve the tradition. Still, activists in the Netherlands as well as others from Sweden and Denmark who spoke with NBCBLK remain optimistic. They say slowly they are making change and also raising awareness about discrimination faced by Black people in Europe that many don’t even know exists.